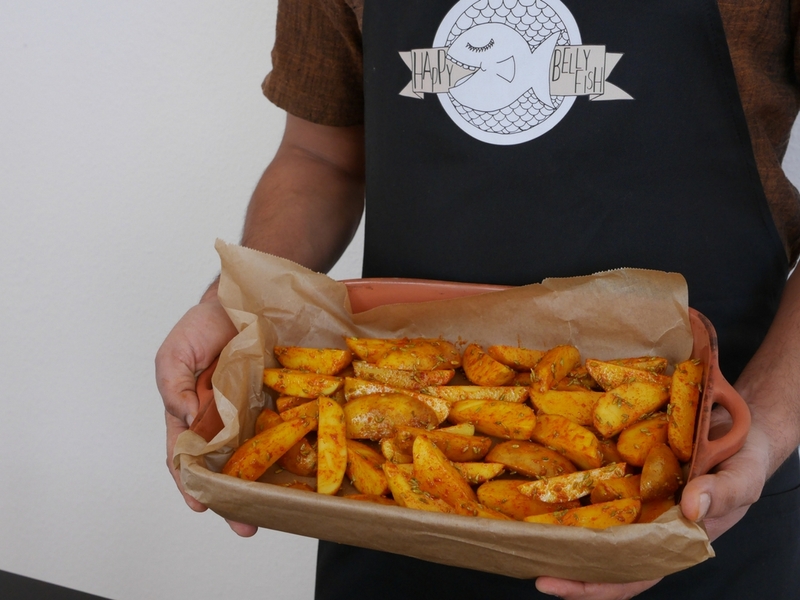 Delicious potato wedges without frying is an extremely easy and fast recipe! It works perfectly as as quick healthy lunch or dinner. If you prefer, you can always skip oil (and bake the potatoes at a very high temperature), and also completely skip molten butter. Spices choice also depends entirely on your taste, we used: turmeric, chilli powder, fennel seeds. Step 1. Wash nicely the potatoes and cut them into 4 wedges. Put them into a mixing bowl. Step 2. Add the spices and some salt and give it a nice mix. Step 3. Add 2 tsp of oil or molted butter and give it a mix again. Step 4. Cover a pan with baking paper, add the potatoes and and bake at 200C for 20-25 minutes.